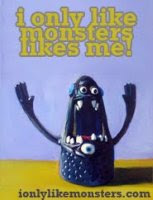 The monsters want to wish you a happy day! This will be one of my new greeting cards! :) I'm excited to see how they turn out.